This collection consists of 177 hand drawn and printed posters from the Student Struggle for Soviet Jewry (SSSJ) Records. Founded in 1964 by Jacob Birnbaum, SSSJ was a pioneer in the movement to oppose the persecution of Jews in the Soviet Union. Birnbaum believed a grass-roots organization of college students who came of age during the Civil Rights movement in the United States were more likely than their elders to engage in the tactics of open protest and civil disobedience. This cause eventually became a mainstream, worldwide movement, considered the most effective advocacy campaign by American Jewry in the 20th century, lasting until the dissolution of the Soviet Union in 1991 and resulting in the emigration of over a million Soviet Jews. SSSJ viewed its mission in a historic context and invoked biblical imagery and language to dramatize its goals, which the posters reflect. Its mantra “Let my People Go” drew a direct connection between its campaign and the Biblical account of the Exodus from Egypt, from which the phrase was taken. The posters also document specific events that occurred and initiatives undertaken during the campaign, such as the Leningrad Trials, summits between Presidents Reagan and Gorbachev, and linking U.S.-Soviet trade policy with freedom for Soviet Jewry. Many of the posters spotlight individual “refuseniks”, Soviet Jews who were refused exit visas, and then typically lost their jobs and were subjected to prison and internment in Soviet forced labor camps. 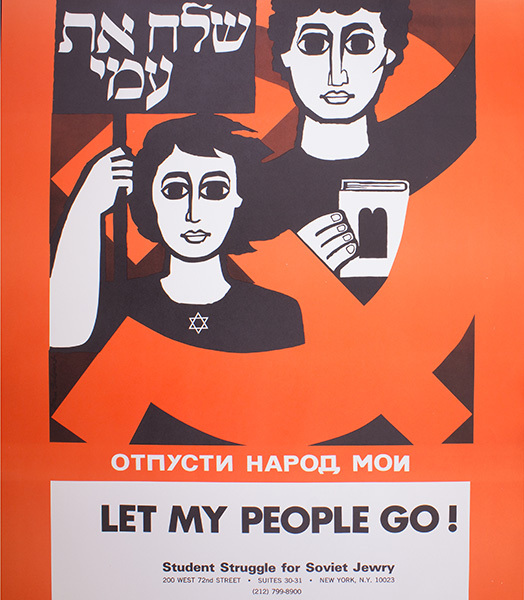 The collection also includes posters from various other Soviet Jewry advocacy organizations contained in the SSSJ Records, as well as posters protesting Arab violence and terrorism against Israel, which, in light of Soviet financial and political support for Arab countries, was viewed as part of the broader anti-Semitic policies of the Soviet Union. This poster collection is part of the SSSJ Records held at Yeshiva University Archives. The finding aid for the parent collection, which contains over 250 linear feet of photographs, printed material, case files of Soviet Jews, administrative records, and audio and video recordings, can be found in Yeshiva’s Finding Aids Database.